Beatlab is an innovative and easy to use music editor program that will in no time enable you to create great composition. No matter if you are only entering into world of music or are a pro, Beatlab will be there for you. Create music and share it with your friends! After starting Beatlab you will be welcomed into streamlined user interface that will offer you to start working on a brand new composition or edit previously made one. 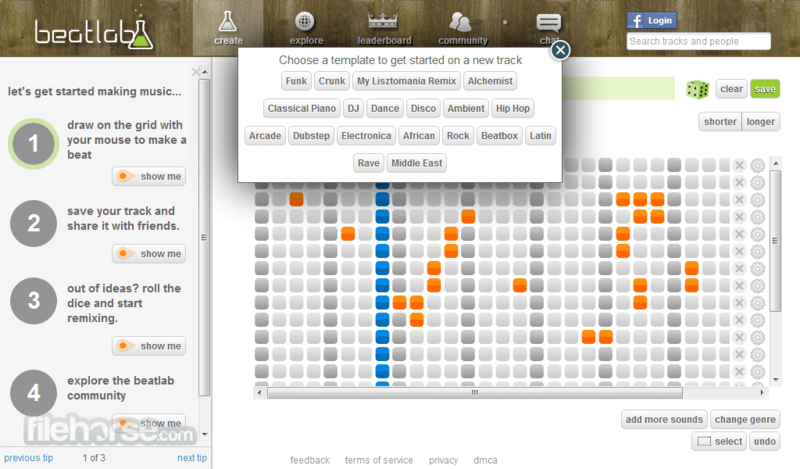 To compose music, just navigate its simple grid-based sequencer, and enable sounds and beats that you want. 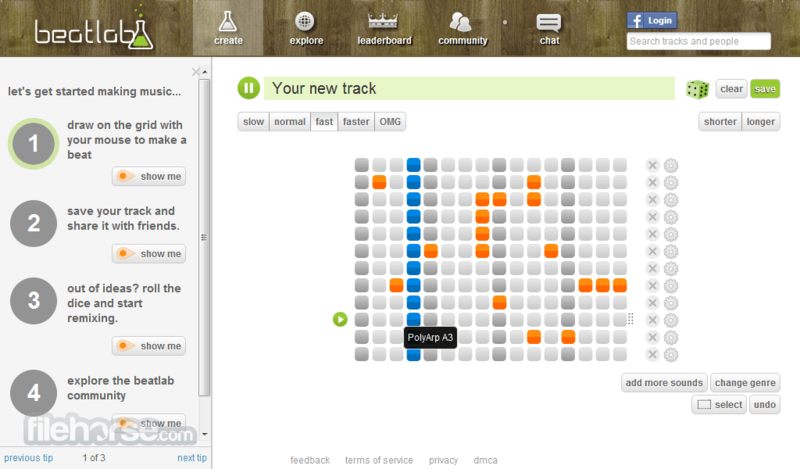 To make the job easier, tracks can even be produced in collaborative environment, with various colors representing work of each participant. After the song is produced, you can instantly share it with you friends, upload to the Internet where it will be available to everyone, or off-course download it to your computer as a MP3 file that you can enjoy it whenever you want. Note: To use Beatlab, you need to disable any Facebook or Flash blockers. Beatlab uses Flash to mix and play audio. Music creation process of modern electronic music has become much easier with the advent of internet and its cloud powered music services that enable anyone to transform their creativity into popular music. This category of websites is very old, and they become more professional, powerful and ready to give you tools that will make you music completely ready to be heard by millions of fans. Sadly, this focus on the creation of better and better tools have left novices and enthusiasts in the back seat, forcing them either to learn complicated new tools, or to simply move to other services that are aimed for casual users. Create music and share it with your friends! One of those applications is Beatlab, online web application that was created to enable everyone to express their musical creativity by focusing itself on the basics that will be instantly accessible to anyone who stumbles upon this service. Beatlab does not features complicated tools, but it offers surprising depth in creating your music beats, which will be excellent news to all who wanted to create music on the go. From the moment you arrive on Beatlab’s website, you will be greeted with the grid and several buttons, and a very short tutorial about how you can instantly make a nice tune. Grid represents 12 instruments, and using only your mouse, you can paint on the beats that will make your music go. Few additional options are placed around the grid – selector of the track’s speed, button for adding more second to your loop, and changing of genre that will switch the look and feel of your greed (add new instruments, loop lengths and speeds). Each of the instruments can be customized with their separate volume, speed, and reverse playback, and truncating of their loop. If the basic list of the instruments that you get via “change genre” button is not enough for you, you can add more from the list of the thousands of available sounds. This sound library is separated in several categories, most notably Drums (7304 sounds), Vocal (4535), Electronic (3445), Bass (3417), Guitar (1723), Piano (1338), DJ (704), and much more. 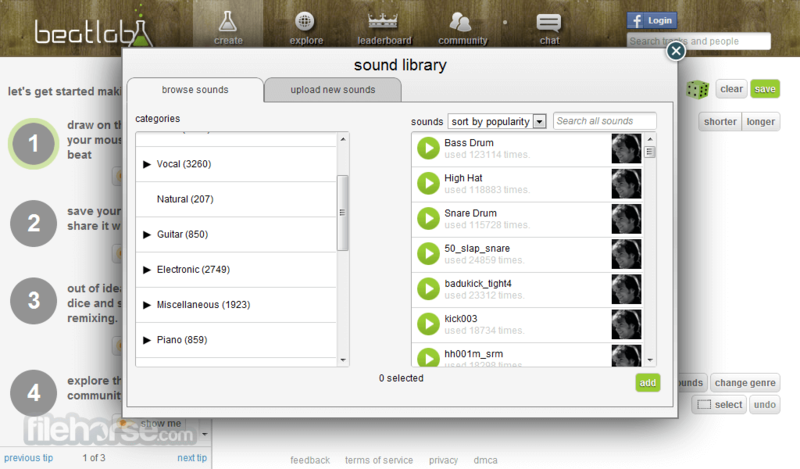 Finding new sounds in this library can also be done via intergrated search engine that can sort results by popularity, name and date. As a special tool, whenever you feel stuck, you can always start with something new and remix your old creations. You can test your music track without account, but in order to save your work you need to log in via your Facebook, Google or SoundCloud credentials. Those 3 options are only ones available for creating new account on Beatlab. Interface of Beatlab is very intuitive and fast, enabling you to create music, add new instruments and everything else with just your mouse and little creativity. All of its tools and elements are presented to you in easily usable fashion. Site itself offers more than simple creation tools. You can see what Beatlab’s community has created, find best music in leaderboards, and engage with community with integrated chat tools. Beatlab is a free service that can be used by anyone who already has Facebook, Google or SoundCloud credentials. There are no subscription fees, locked features and every user gets same level of service. Beatlab is an excellent electronic music editor that is focuses on novices who are encouraged to create interesting beats in mere seconds and minutes. If you want to quickly create your own music loop that you can share with your friends and family, Beatlab is the perfect service for that. Create music and share it with your friends!